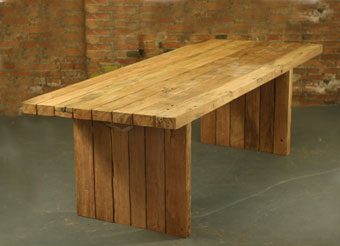 This table is made from multiple super thick lengths of reclaimed ( reconstruction ) teak. It will fade to a silver grey outside and is suitable for indoor or outdoor use. We salvage pieces of 100 year old teak from old bridges and disused colonial buildings to make our furniture. We do not finish the teak because the wood is so beautiful in its natural state and sometimes we deliberately leave holes. If you wish to seal a piece for interior use we recommend OSMO wax. Outdoor furniture can be oiled with teak oil but it will change the colour of the old teak. Price depends on the weight, thickness and quality of the wood used. Old teak is sold by the cubic meter and the price is going up all the time. Once it is gone it is gone. Teak of this quality is not grown anymore. Contact Emily directly on +44 7802 732 753 if you wish to arrange an appointment to view a table or require more photographs., or complete the form below. Please enter your contact details and a short message below and I will respond as soon as possible.